The following size of this frame is ON BACKORDER until approximately 6/14: 16 x 20. Orders will be placed on hold until we get more inventory. Apologies for this delay. 5" x 7"6" x 8"8" x 8"8" x 10"9" x 12"10" x 10"11" x 14"12" x 12"12" x 16"12" x 24"14" x 18"16" x 20"18" x 24"20" x 24"20" x 30"24" x 30"24" x 36"
The frame is well constructed, but the online photo suggested it was more of a soft dull gold. In reality it is extremely bright, and not the effect I was looking for for my limited palate still life. Photo attached. Thank you for your feedback. The frames are photographed to give the best depiction of the color of the frame. We encourage you to please order free samples before placing your next order. If you would like to return the frame, please give us a call at 1-800-332-8884. Thank you for your feedback. I am a daily painter and sell a lot of my work. I show most of my work in these frames. They look great in a gallery when they are all on the same wall. Most people prefer gold frames and their cost is very reasonable. My recent exhibit resulted in very strong sales, and the frames from Picture Frames.com enhanced the presentation considerably. This is my favorite frame. The gold is the truest gold I’ve found. It’s versatile for both traditional and modern paintings. Prompt response with order, excellent craftsmanship of frame and great price. Great service and products. Lightning shipping is a bonus!!! Great service. I made a mistake on dimensions and they were quick to help me correct my blunder. Great frame, really made my painting pop!!!! This frame makes my daughter's colored pencil portrait of her and me look like a million bucks! A popular style in a good quality frame at a reasonable price. I would recommend it to my friends. Beautiful frame! Exactly what I wanted and very easy to assemble. I would definitely buy it again. 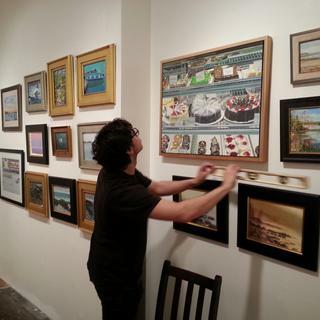 We have purchased several Plein Air frames from pictureframes.com over the years to hold oil canvasses from local artists. The canvasses mount easily although we usually back them with inexpensive foam core from the local craft store. Frames arrive well packed although on one occasion without the required mounting hardware. Prices are reasonable, quality excellent, and really add to the art. Compared to first purchase from you, which was fantastic, the quality is not great: Inferior wood with some splintering. Gold leaf stringers hanging from edges and some chipping. But, it does it's job and looks OK.
Hello Ken! Thank you for your review. We regret that you are not 100% pleased with the frame. Our quality is extremely important to us and we want to determine what could have happened. If you would please email us photos of the condition of the frame, we are happy to send you a free replacement. Please email the photos to: customercare@pictureframes.com. We look forward to making this right with you. Have a great day! The gold leaf finish comes off too easily.some packing tape got on it and lifted it off. Hello Deborah! Thank you so much for giving us your feedback. This beautiful frame has a leafing finish that reveals some of the undertones of the frame. The character of the frame is very unique and exquisite. We regret that you are not completely satisfied and we would like to offer you the opportunity to return the frame. Please give us a call at 1-800-332-8884 so that we may set up the return authorization over the phone. Thank you for your business! The frame will perfectly enhance the painting it is framing! Its classic and simple. I like it. I chose this frame for it's width and profile. My canvas is 36 x 24 so a narrower frame would not be of good proportion. The simple style will go well in a more contemporary setting. 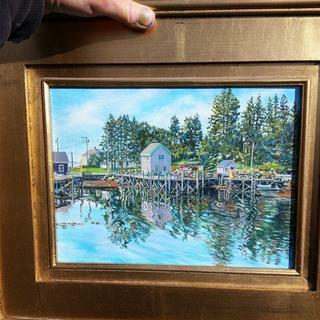 We needed the 3 and 3/4 inch frame in order to brighten a painting which was painted at dusk. 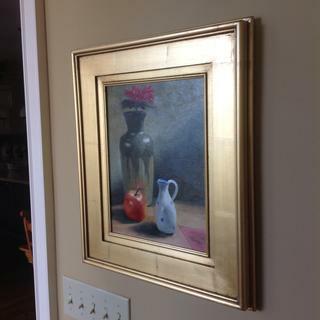 This frame had the width and the correct shade of gold for our painting. Good value for this size. used this frame last summer and it is an awesome gold frame! looks great with my paintings. 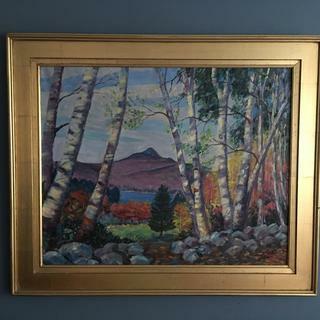 Good classy frame for an old painting on wood or panel. The image goes to the bottom of the canvas, and this frame has a lip that is only 1/8. Also wanted it to be a wide frame. I am out of this style and size . Needed it. BEST ANSWER: Hello Jay! Thank you for considering us for your framing needs. This beautiful frames does not come in a Custom Size, however, we have the Plein Air Royale Collection that has custom sizes available. 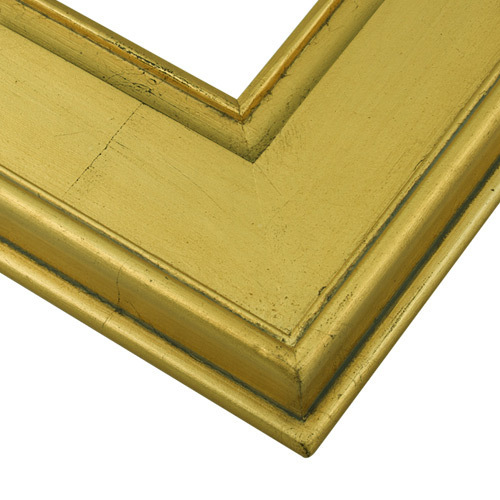 Take a look at the exquisite Gold Frame below from the Plein Air Royale Collection. If you need further assistance, please give us a call. We can be reached at 1-800-332-8884. Happy Framing!